Defendants' motion to dismiss under the first-to-file rule was granted where the court found that an amended complaint in a different lawsuit naming plaintiff party to that lawsuit related back to the original complaint. "[T]he following threshold question must be answered: for the purposes of the first-to-file rule, does an amended complaint that names a new party relate back to the original filing date? . . . This Court has been unable to locate any Federal Circuit precedent directly answering the threshold question, nor has either of the parties provided such authority. . . . [I]t is the court which first has possession of the subject matter of the lawsuits that is the first-filed court." In granting defendant's motion for summary judgment of noninfringement, the court rejected plaintiff's argument that "the Federal Circuit’s decision [upholding the ITC's findings of noninfringement] and factual findings are not binding and it can raise issues not previously presented to the ITC or Federal Circuit. I do not find [plaintiff's] arguments persuasive, particularly since the determinative issues presented to the ITC, the Federal Circuit, and this Court are essentially the same. In short, [plaintiff] is inviting this Court to revisit the same judicial landscape with its new counsel as its guide. . . . I find no 'powerful incentive' to deviate from the Federal Circuit’s prior decision. Here, the same parties argue whether two of the same [products] infringe the same claim in the same patent as they argued previously before both the ITC and the Federal Circuit." Following a bench trial, the court found plaintiff's patent for the brain cancer drug Temodar® unenforceable due to prosecution laches and inequitable conduct. "[T]he 'ends' - commercialization of a very successful cancer drug - do not justify the 'means' employed by [plaintiff] in this case. Taken in the totality, this case involves eleven patent applications, ten abandonments, and no substantive prosecution for a decade. The court rejected plaintiff's argument that "the absence of 'intervening rights' precludes [defendant's] prosecution laches defense. . . . Nowhere in [Symbol Technologies, Inc. v. Lemelson Medical, Education & Research Foundation, 422 F.3d 1378 (Fed. Cir. 2005)] did the Federal Circuit affirmatively impose a particular requirement that a competitor have invested in the technology claimed in order for prosecution laches to apply. The magistrate judge recommended granting in part defendant's motion for issue, evidentiary, and monetary sanctions by (i) precluding plaintiff from claiming damages for four products (ii) precluding plaintiff from relying on financial data and other documents produced on and after the last day of discovery, and (iii) requiring plaintiff to pay defendant's costs and fees associated with the motion for sanctions and certain additional discovery. "'If there is a hell to which disputatious, uncivil, vituperative lawyers go, let it be one in which the damned are eternally locked in discovery disputes with other lawyers of equally repugnant attributes.' Counsel continue to fail themselves, fail this Court, and fail their clients by treating the discovery process as a forum for gamesmanship, spiteful rhetoric, and the proliferation of unnecessary paper." The court granted plaintiff's motion for summary judgment of invalidity for lack of written description as to claim elements directed to "macrocyclic lactone analogs" of rapamycin. "Besides the requirement that the compounds be 'structur[ally] similar' to rapamycin, the [asserted patents'] specification provides no further guidance regarding the claimed analogs. . . . The parties do not genuinely dispute that, at the time of the inventions, a small number of such analogs were known, but many more existed. . . . It follows that, if the complete universe of 'macrocyclic lactone analogs' of rapamycin were unknown to the inventors, it could not have been adequately described (or enabled) by a specification that does not even attempt to discuss the term." In granting defendant's motion to stay pending reexamination, the court rejected plaintiff's argument that it would be prejudiced by a 2-3 year stay and a 3-4 year appeals process. "'[T]he prejudice claimed by Plaintiff applies equally to any case where reexamination is sought. It is for that reason that courts have found that 'delay inherent in the reexamination process does not constitute, by itself, undue prejudice.' Moreover, Plaintiff ignores that the reexamination process was enacted by Congress to provide certainty in the validity of patent rights and to provide a faster, less expensive remedy than litigation when the validity of a patent is at issue." For purposes of determining a reasonable royalty, the court permitted certain evidence of Google's acquisitions of other companies. "Because Google relies upon acquisitions, instead of traditional licenses, to procure intellectual property, [plaintiff's damages expert] used these acquisitions in his analysis." Specifically, the court permitted evidence (i) "that Google valued [an additional 2 billion impressions per week for Google’s AdSense for Content] at $2 billion" (gleaned from Google's acquisition of Doubleclick), (ii) "that Google paid 23% of its net assets . . . to delay a competitor from participating in the AdSense for Content market" (gleaned from Google's acquisition of Applied Semantics), and (iii) that "in a hypothetical negotiation, Google might have paid [plaintiff] a running royalty or some other non-fixed amount" despite Google's argument that it has "a strong preference for lump-sum licenses" (gleaned from Google's acquisition of dMarc). The court excluded evidence of "the dollar amount Google paid to acquire any organization" and evidence concerning Google's acquitition of YouTube and AdMob. Unlike the dMarc acquisition, plaintiff failed to show that the YouTube and AdMob acquisitions refute Google's stated preference for lump sum licenses. The court denied plaintiff's motion to exclude testimony from defendant's damages expert which "converts Google’s grant of equity (2% of its stock) into a running royalty." "Although [defendant's expert] admits that he had not seen anyone perform his exact calculation, [defendant] asserts that the calculation is based upon widely accepted finance theory. . . . Through cross-examination of [the expert], [plaintiff] may address the reliability of the expert’s calculations." Although defendant arguably established that the case was exceptional, the court denied defendant's motion for attorneys' fees because defendant's motion was "[a]t best . . . rife with error and extremely sloppy; at worst . . . misleading and/or made in bad-faith." "To say the least, it takes considerable chutzpah for Defendant to argue that its fees should be paid because Plaintiff brought motions and continued litigation without a good faith basis when Defendant’s own motion raises various frivolous arguments that ignore binding Federal Circuit precedent or orders by this Court in this case on the exact issue." Plaintiff was entitled to a permanent injunction even though it previously licensed the asserted patent to a third party to develop a video game based on plaintiff's patented board game. "The defendants insist that [plaintiff] has licensed its patent, which suggests that money damages are adequate. The Court disagrees. . . . Given that [plaintiff] and [the manufacturer defendant] are direct competitors and the retailer defendants stock only [the manufacturer defendant's product] and no others, the Court finds that [plaintiff] has shown irreparable injury for which no adequate remedy at law exists." The court granted defendant's motion to stay pending reexamination even though the PTO had not yet granted reexamination. "95% of reexamination requests have been granted. The Court finds that were the patent-in-suit to be denied reexamination, staying this case [for approximately two months], at the latest, would have a minimal effect on the litigation schedule. Accordingly, the Court is not persuaded that the motion should be denied merely because PTO has not yet accepted [defendant's] application for reexamination. . . . If the PTO decides to decline reexamination of the . . . patent, the stay may be lifted and litigation will resume upon motion by either party." Where defendant asserted counterclaims for declarations of noninfringement and invalidity, the court sua sponte ordered defendant "to either explain the need for the present counterclaim or to file an amended pleading to take its place." "[T]his Court has consistently been bemused over the years by the penchant of patent lawyers to advance counterclaims that do nothing more than mirror the allegations of patent infringement complaints. Here (as always in such cases) [defendant] is charged with patent infringement, something that necessarily depends on the existence of a valid patent. After all, both infringement and validity must be proved by [plaintiff] to justify its recovery under the Complaint. Hence it is difficult to understand just what (other than extra paper) is added to the case by a counterclaim that seeks declarations of non-infringement and invalidity of the patent in issue." The court granted plaintiff's motion for a permanent injunction in light of eBay Inc. v. MercExchange, L.L.C., 547 U.S. 388, 391 (2006), even though defendant had ceased manufacturing the infringing product and argued that a redesigned product did not infringe. With respect to irreparable injury, "Plaintiff has demonstrated it lost market share, the right to control its patent license agreement, and its competitive advantage as a result of Defendants’ conduct. These losses are sufficient to demonstrate irreparable injury." With respect to adequacy of legal remedies "Plaintiff lost its status as the sole provider of soft shell pain pumps. . . . [and] [t]hat is an injury from which Plaintiff is unlikely to recover, and is one that is not amenable to a legal remedy." With respect to public interest, "Plaintiff identifies three public interests that would be served by an injunction: The interest in maintaining a strong patent system, the interest in fair and healthy competition, and the interest in discouraging future wrongdoing.' The Court agrees with Plaintiff that these interests would be served by an injunction in this case." Defendant's motion to stay pending inter partes reexamination was denied based upon "the [trial setting in 10 months] and timing of the request for reexamination." Zapmedia Services, Inc. v. Apple, Inc., 2-08-cv-00104 (TXED January 7, 2010, Order) (Everingham, M.J.). Defendants' motion to stay pending ex parte reexamination was denied based on "the lack of a final rejection in the proceeding, the fact that the plaintiff and defendants are competitors, and the uncertain timeframe in which the reexamination will be completed." Satellite Tracking of People, LLC et al v. Pro Tech Monitoring Inc et al., 2-08-cv-00116 (TXED January 7, 2010, Order) (Everingham, M.J.). The court granted plaintiff's motion for summary judgment of indirect infringement based on defendants' use of a label containing "instructions on how to use the product in a manner that encourages acts of infringement" even though "doctors prescribe the drug for a number of non-infringing uses" and defendants used the label only because it was required by the FDA. "Here, the accused infringers will be labeling the product in a manner which encourages direct infringement by others. . . . This objective evidence is critical in determining whether intent to cause infringement exists, and such evidence is sufficient to establish Defendants’ intent." Defendant's motion to stay pending reexamination was denied even though the case was "in the early stages of litigation and discovery [had] not yet begun." "Plaintiff contends that a stay would delay the possibility of them obtaining an injunction to prevent ongoing infringement by the defendant and that the defendant is a thinly capitalized company without great resources. The parties are direct competitors and a denial of timely enforcement of either party’s patent rights would indeed unduly prejudice that party." Defendant's motion for attorneys' fees under § 285 was granted. 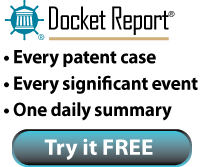 "[Plaintiff] has a history of filing nearly identical patent infringement complaints against a plethora of diverse defendants. . . . In each case, according to [defendant], the complaint has been followed with a demand for quick settlement at a price far lower than the cost of litigation, a demand to which most defendants apparently have agreed. . . . Firm in the belief that [plaintiff's] claim of infringement was baseless, and that the lawsuit was filed for the improper purpose of collecting a nuisance settlement, [defendant] alone chose to litigate rather than settle. In so doing, [defendant] has incurred significant expense for the four years of litigation, far beyond what it would have paid to settle. [Defendant's] refusal to agree to the settlement demand for what it legitimately believed was a bad faith claim of infringement further supports a finding that this case is 'exceptional' . . . It would be a gross injustice to [defendant] to require it to bear the expense of defending against the baseless lawsuit, one that was filed in bad faith for the sole purpose of inducing defendant to settle without questioning the patent itself or its validity. An award of attorney’s fees pursuant to § 285 is therefore appropriate." Defendant's motion to stay pending inter partes reexamination was denied. "[T]he average pendency for an inter partes reexamination is 41.7 months. . . . [Defendant] is correct, of course, that some courts have granted stays pending reexamination despite the prospect of a drawn-out PTO proceeding. But the prejudice to the non-moving party must be measured not only by the delay attendant to a PTO examination, but also in terms of the length of an alternative proceeding in a district court. This judicial district holds the record for the fastest disposition of patent cases, resolving cases on average within half a year. Thus, the prejudice which would result from a stay in the present case is more significant than it would be if the parties were litigating in a district where judicial proceedings take longer to resolve." Defendant's motion to compel a continued deposition of plaintiff's 30(b)(6) witness was granted where "in 74 minutes [of deposition], there are 92 objections. Either one party can’t ask questions or the other party makes far too many objections. Having reviewed as much of the deposition as needed, the Court finds the latter. . . . [Defendant] is limited to 8 full hours of questioning. Once [plaintiff's] objections total 100, the deposition time will be extended for 1 more hour. For every 50 objections thereafter, [defendant's] time will be extended 30 minutes. Of course, if [defendant] phrases its questions to draw meritorious objections just to increase its time, [plaintiff] may seek immediate relief with the undersigned where a finding of bad faith will result in immediate cessation of the deposition."